November 30 2018: The latest monthly Office 365 updates include an option to lock the zoom level. I get quite a few complaints from people who say their fonts are tiny (or huge) or the font used for the reply shrinks yet Microsoft Outlook shows they are using a normal size font (such as 10 or 12 pt). Outlook users with high resolutions screens may have a problem reading incoming emails. This is caused by the Zoom setting. If you are an Office 365 subscriber, you can now set Outlook to remember your zoom level. 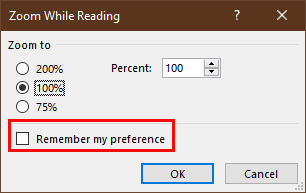 To lock the zoom level reading messages, open the Zoom While Reading dialog and tick the box to Remember my preference. You can open the Zoom while reading dialog by clicking on the zoom % in the status bar or look for the Zoom button on the Message menu in an opened message. Then tick the box to remember your preference. When your incoming email is zoomed, the easiest fix is to hold Ctrl as you roll the mouse wheel (this is the likely cause for many people). Keyboarders can use the Ctrl and plus (+) or minus (-) keys to change the zoom level in increments or Ctrl and the zero (0) key to go to 100%. Note: these keyboard shortcuts do not work in Outlook 2013/2016. You can also click the Zoom button in the ribbon and set it back to 100%. 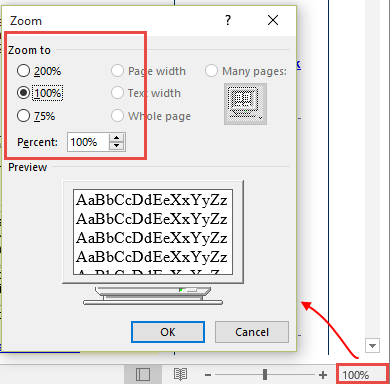 Click the button in the ribbon to open the zoom dialog and select the desired zoom level. Outlook 2010, 2013, and 2016 have a zoom slider in the main Outlook window status bar (on the right side). Use this slider to adjust the zoom in the reading pane. If you prefer, you can click on the zoom % (100% in the screenshot) to open the zoom dialog. Note that changing the zoom setting is not persistent for reading messages. To make the zoom level persistent, you need to use an add-in or a macro. A list of zoom tools is in the Tools Section and a macro is at the end. Many times, when you make the change to a message you are composing and send it, the next message you compose reverts to the goofy zoom setting. This is because making changes to a message then sending the message applies the changes to that message only. If you make the changes then close the message, it should apply the changes to all future messages. When zoom is stuck on a value (usually a tiny font), you can reset it by changing the zoom level then closing, but not sending, the message. If you change the zoom level then send, the change applies only to the message you changed, not to future messages. In Outlook 2016, the Zoom button is on the Format Text ribbon. In Outlook 2010 and 2013, the Zoom button is on the Message tab when composing (or reading) a message. Click new message (or reply) and the zoom should be the desired level. The Zoom Email Windows tool for Outlook automatically zooms all Outlook reading pane windows. It zooms every Outlook window to your specified zoom factor. It's perfect for being able to instantly and clearly see the email and other Outlook windows. ZoomIn can save your preferred Outlook email zoom setting. While the zoom level is persistent when you change it in the compose mail window, it's not persistent when you change it for incoming messages. This macro requires the use of Redemption (Developer Edition). You need to set a reference to the Microsoft Word Object Library in the VBA's Editor. It's under Tools, References. If it's not set, you'll get a Compile Error: User-defined type is not defined. To use with the reading pane, you need to disable conversation view. See "How to use Outlook's VBA Editor" for instructions and screenshots. Not shown in the video: You need to set a reference to the Microsoft Word Object Library in the VBA's Editor. It's under Tools, References. If it's not set, you'll get a Compile Error: User-defined type is not defined.. This macro goes in ThisOutlookSession. First: You will need macro security set to low during testing. To check your macro security in Outlook 2010 and up, go to File, Options, Trust Center and open Trust Center Settings, and change the Macro Settings. In Outlook 2007 and older, it’s at Tools, Macro Security. If Outlook tells you it needs to be restarted, close and reopen Outlook. Note: after you test the macro and see that it works, you can either leave macro security set to low or sign the macro. Now open the VBA Editor by pressing Alt+F11 on your keyboard. Set your macro security to Low in File, Options, Trust Center, Trust Center Settings, Macro Settings. Expand Project1 and double click on ThisOutlookSession. Click in the Application_Startup macro and press the Run button to kick start it without restarting Outlook. Application_Startup macros run when Outlook starts. If you are using an Application_Startup macro you can test the macro without restarting Outlook by clicking in the first line of the Application_Startup macro then clicking the Run button on the toolbar or pressing F8. More information as well as screenshots are at How to use the VBA Editor. Has anyone found a solution - that works - to the annoying Zoom feature of Outlook 2013 ? My menu & folders screen are zoomed out & I can't correct. My email messages are normal. Can you help with this? Thank you so much! When the text in the interface is tiny, its a bug that should correct itself with a couple of restarts. This awesome! Is work !! Very thanks! Diane thank you for the great discussion. The Zoom Macro is a lifesaver. There is one thing that's unfortunate. I need to click twice on the same message (with delay between click because double clicking without delay would cause it to open in a new windows) for the macro to work on the reading pane. I use Outlook 365 with Windows 10. Do you have this problem ? I hadn't noticed it, but will try to repro. I had a user call about this today and as so often happens I found the solution right here. Thank you! One thing I've found that is unfortunate is that you said "Keyboarders can use the Ctrl and plus (+) or minus (-) keys to change the zoom level in increments or Ctrl and the zero (0) key to go to 100%. Note: these keyboard shortcuts do not work in Outlook 2013/2016. " We're using 2016. Why would MS Office have turned that off? Many of our users have touchpads (Dell E5450 laptops) and that's all they use when on the road and gestures like scroll are off so accidental scrolling doesn't happen - leaving mouse movement, so without the keyboard shortcuts and gestures is there anything that can zoom more simply than the Zoom option in Format Text? I tried various Shift, Ctrl & Alt keys with + and - but to no avail. Is there a way to add the zoom slider to the bottom right of a compose email window? In an open message, Alt+HQ12, Enter works. Not sure that qualifies as a 'shortcut' though. :) The zoom slider cant be added to the form. You can add the Zoom command to the Quick access bar so its easier to access if using collapsed ribbon. Without an external mouse, you can use the scrolling feature/function of the touchpad. Usually this is either swiping up/down along the right edge of the touchpad, or 2-finger swiping up/down. It would be CTRL-SCROLLUP and CTRL-SCROLLDN however you achieve that behaviour.